This introductory tutorial shows how to code a simple page swiping app with the ViewPager class. It is the basis for more complex view flipping examples, such as an image swiping gallery (to replace the Android Gallery widget that was deprecated in API 16). The ViewPager controls the swiping (flicking the screen left and right) between multiple screens or pages of data. 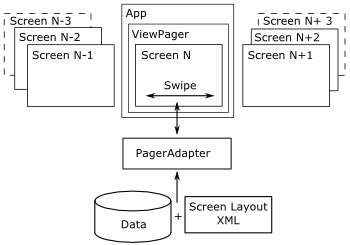 The ViewPager is fed with the multiple screens by a PagerAdapter (or the sub-classes FragmentPagerAdapter and FragmentStatePagerAdapter). Start a new Android app in Android Studio. Add the ViewPager widget to the app's screen. Define the data (text) to be displayed on each swiped page. Define the layout for the swiped pages. Implement PagerAdapter which will create each page and load it with data. Start this tutorial by generating a new project in Android Studio, here it is called it Swipe Demo. (Alternatively add the page swiping effect to an existing App.) Use an Empty Activity with other settings left at default values. 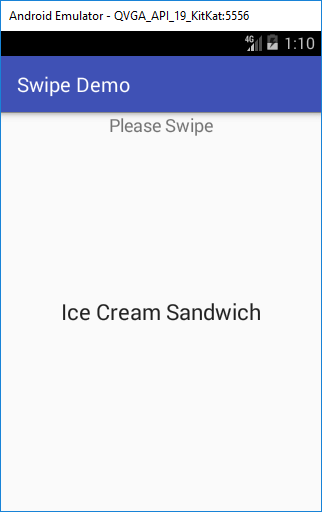 Update: The minimum Android API required for the ViewPager Support Library is now API level 9 (Gingerbread), or API level 14 (Ice Cream Sandwhich) if developing apps using Google AdMob for advertising. The ViewPager is part of the Support Library. If not installed use the SDK Manager to download it (scroll to the bottom of the list of items in SDK Manager to find the Android Support Repository). See also Support Library Setup on the Android Developers website. In the main class file, here called MainActivity.java, a string array is declared at the class level, String pageData, and loaded from the resource in the onCreate method using pageData=getResources().getStringArray(R.array.desserts). getcount() – Returns the total number of pages and here it is simply the number of strings in the array so returns pageData.length. instantiateItem() – This is passed a reference to the ViewPager so the new page can be added to it, and the page number so that the correct data for the page can be loaded. In our implementation we use a class level LayoutInflater to create an instance of page.xml, and set the TextView to a string in the pageData array. isViewFromObject() – A method required by the ViewPager to check that a page matches the object from which it was created. destroyItem() – This is called when the ViewPager no longer requires the page (it is now several swipes away so can be cleared). String pageData;          //Stores the text to swipe. The source code is also available in the text_swiper.zip file ready to import into Android Studio (also available from the Android Example Projects page). This simple swiping App can be extended to support different types of data. See some more Android Example Projects. Ahmad on September 4, 2014 at 3:04 am said: Very useful and detailed. Thank you very much! Dewan on July 14, 2015 at 6:23 am said: It’s so perfect! Thank you. This is helping me a lot. Aelafseged on August 11, 2015 at 11:25 am said: So neat and to the point. I salute you for your Javaness!!! Raul on November 9, 2015 at 8:47 pm said: Thank you very much! This is the first example that is simple and actually works! Muhammad Mubeen on February 14, 2016 at 9:45 am said: How to create multiple swipe view? Can anyone help me please?